A central location for families to post ‘Rabbi Gig Requests’ – Multiple answering bio’s of rabbis to choose from. Post a ‘Rabbi Gig Request’ specifying your needs and have multiple answering bios of rabbis to choose from. Families can have carefully tailored ceremonies with a personalized experience from start to finish. Many people have difficulty getting in touch with a Rabbi when they are needed. 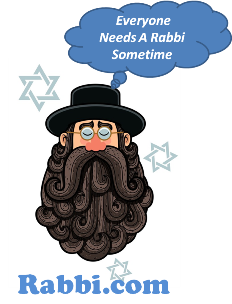 A goal in creating Rabbi.com was to assist families in need of a rabbi through the often daunting process of finding a rabbi. Let us help you find YOUR rabbi.